We are grateful we have been entrusted with the responsibility and privilege of caring for special friends like Judy, and encourage others to adopt a special needs animal and educate others about those the world has forgotten. Dashing through the door of the feedstore and out of the downpour, I rushed over to the counter to make my order of feed for our sanctuary residents before they closed for the evening. As I checked out, I heard muffled voices huddled over a cardboard box nearby. “What are we going to do with her?” one staff member asked. “Absolutely,” the word was out of my mouth before she finished talking, and I hugged the box close to my body as I slipped out into the rain. 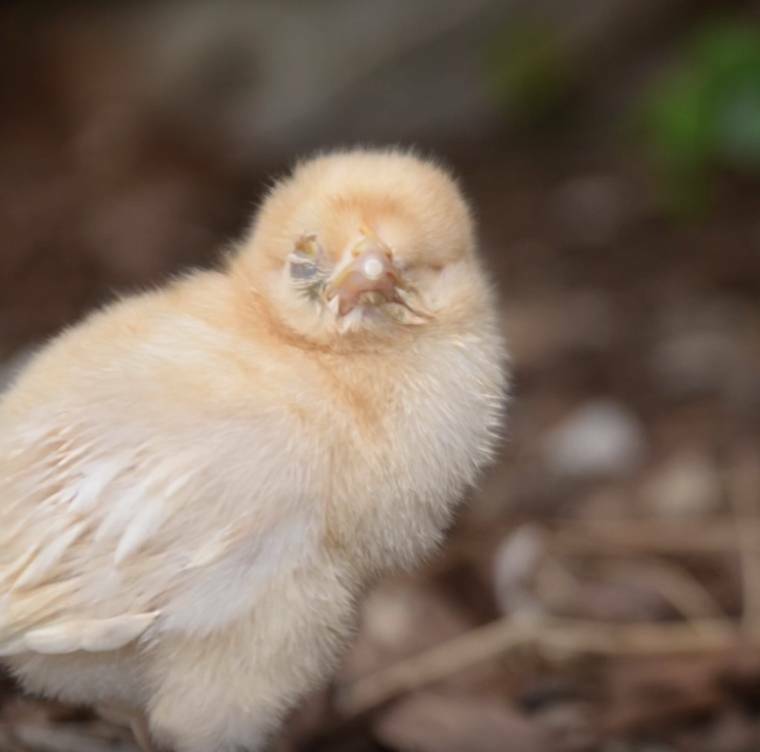 In the palm of my hand, I lifted out a tiny, bright yellow, very fluffy, adorable baby chick. “How is she going to eat?” he asked. I wondered the same thing as we drove home to the sound of tiny cheeps, thus beginning our experience caring for special needs birds. Flash forward a few years later. Mrs. Puff is now a thriving, albeit still blind, adult hen. After learning more about the backyard egg industry we realized some startling and disturbing truths. Birds who are deemed disabled, sick, or otherwise weak, are placed around the edges of the shipping boxes while being sent from hatcheries to feed stores to act as a sort of “packing material.” Horrified? We sure were. If said birds happen to survive the harrowing journey through the postal service they are most often “disposed of” by feed stores. Indeed some national chain feed stores have a policy where they are directed to get rid of the sickly birds rather than relinquish them to individuals or sanctuaries who will care for them. Luckily for Mrs. Puff and our other special friends, one of our locally owned stores contacts us anytime they think there is a bird who needs care that we can provide. It is often a major time commitment, and a great deal of work, but each individual is just as deserving as a special needs human child would be of receiving proper care and love when brought into this world. When Puff arrived as that fluffy little baby, we ended up feeding her with a syringe round the clock for over a month and weighing her on a tiny scale to be sure she was gaining enough weight. Finally after much encouragement, she figured out how to eat and drink on her own and has now even been to school assemblies where she shows off her incredible hearing by finding a bowl of food we tap on from across the stage. Since then we have taken in two other chicks born without eyes, an adult duck with a permanent neck disability, two severely crossbeaked baby chicks, a wry neck chicken, and two hens with permanently crippled legs (one which was eventually amputated). This adult duck has a permanent neck disability. The most difficult part of living with special needs animals is not the time and energy required to care for them, but the fact that many of them have shorter lifespans due to congenital issues. We do the very best we can for them while they’re with us and they are incredibly impactful ambassadors to all who visit the sanctuary. 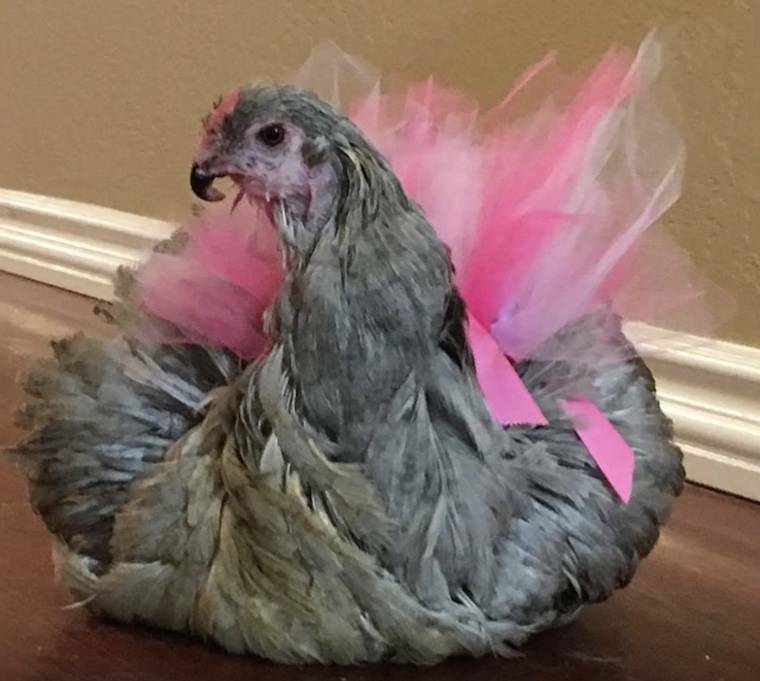 Betty Butters, one of our blind hens, passed recently from an inoperable cyst pressing on her brain that caused her to become confused, off balance, and unable to stand or eat on her own. We fed her by hand for two months while we had vets run tests to attempt to diagnose her, and we still miss her terribly though we know her life touched many others. 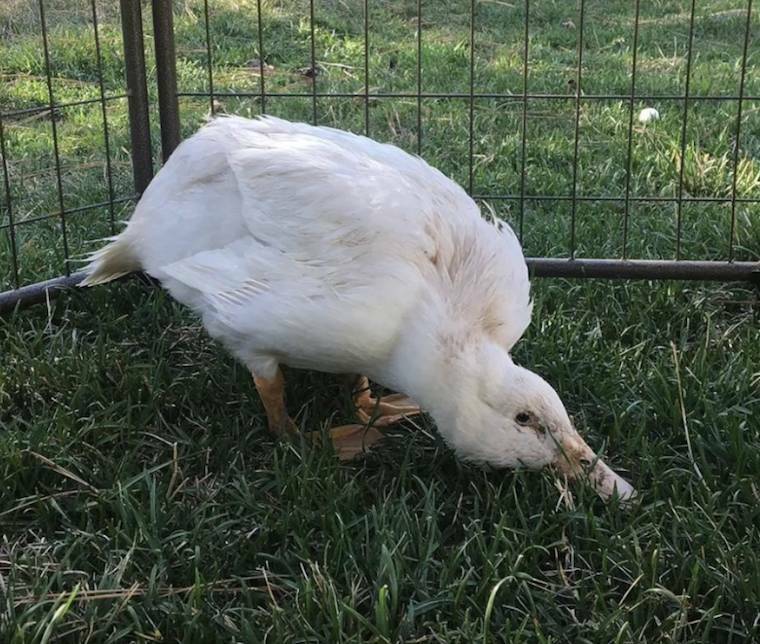 Judy, one of our most popular residents is the result of a backyard breeder using “selective breeding” to attempt to hatch babies with rare traits such as certain colors. Inbreeding, improper incubation, and a host of other factors can cause major problems in development. Along with males who are unwanted (due to their loud voices and lack of egg production) and eventually given away or sold for meat, many breeders do not want to care for sick or disabled female birds who require any amount of extra time or effort. Judy with a severe crossbeak upon her arrival at the sanctuary. Judy will be lovingly spoonfed for the rest of her life because surgery is not an option. Judy has such a severe crossbeak that she will never be able to eat on her own. We have taken her to two avian specialists, and after a hospital stay where CT scans were done, we now understand that her bone structure is such that surgery isn’t an option. 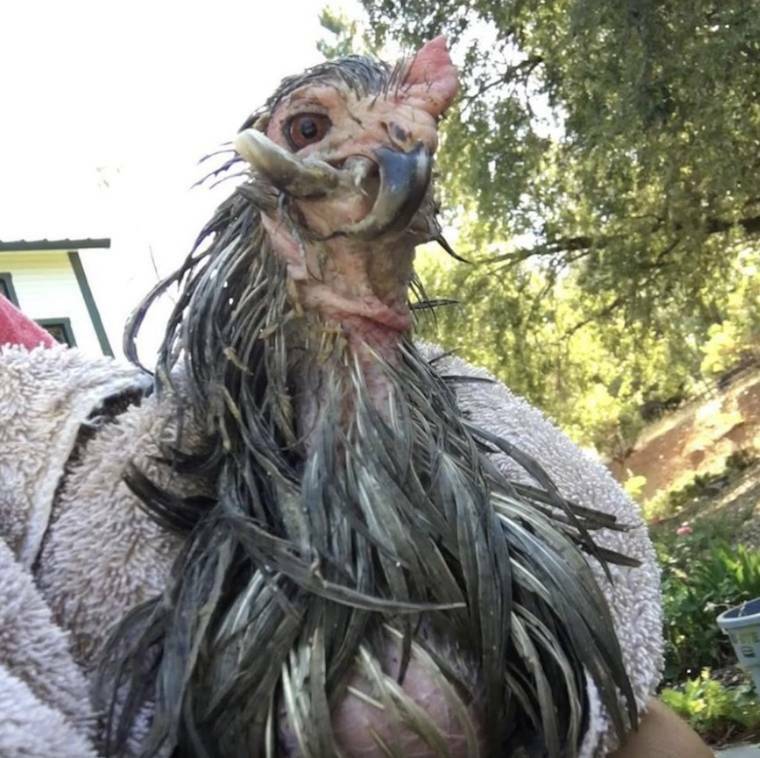 Her personality is goofy and loving, and because she has been and will continue to be syringe fed for the rest of her life, she is very comfortable with people and is a prime example of what silly and loving companions chickens can be. We are grateful we have been entrusted with the responsibility and privilege of caring for special friends like Judy, and encourage others to adopt a special needs animal and educate others about those the world has forgotten.